I treated myself to a nice, new journal the other day. I’ve been wanting to try art journaling for a long time, and I can never seem to get started. So many choices, I was always overwhelmed! What type of paper? Should I bind the journal myself, or purchase one? What should I write about? What if I can’t really draw? But I admired so many artists’ pages and secretly wished I could express myself in the same media… I blog, so journaling in and of itself isn’t really a problem, but facing that blank page was terrifying! 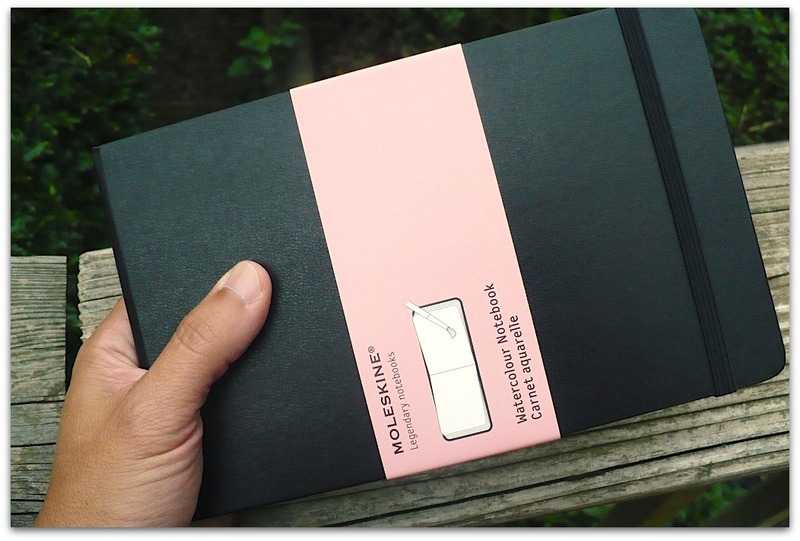 Surfing on Amazon the other day, I looked through my wishlist and found that I had placed a Moleskin watercolor art journal on the list a couple of years ago. Impulsively, I put it in my shopping cart, added a copy of Harry Potter and the Sorcerer’s Stone (to read to my kids! ), and checked out. The journal and the rest of my order arrived yesterday, and this morning, I removed the shrink wrap, fully intending to dive in immediately. Instead, I find myself thinking about the journal rather than creating in it. I’m trying to decide what (if any) particular subject matter I want this journal to be about — a travel story about our epic family road trip to Miami in June? Or a journal about my recent return to riding horses, and all the emotion and significance that brings forth? Or a journal about my everyday life here with my family? Or, I know! How about a journal with a theme of inspirational quotes and images that are inspired by them? The options are endless! Probably the best course of action is to just open the journal and go for it. I tend to like heavily text-based journaling, so I’m thinking I am going to choose a favorite quote as the subject for my first page, and break out my paints and pens and get on with it. I know I want to write about horses and riding, and it only occurred to me today that I can use images of the horses I ride — I don’t have to be able to draw them to include them! What a relief that is! 😉 Once I get started, I know things will roll along; it’s making that very first mark on the first page of my heretofore untouched journal book that strikes fear into the hearts of not-so-confident new art journalers like me. I know I also have to quit thinking in terms of “wasting” my materials or somehow “ruining” my journal book. It doesn’t have to be perfect, it just has to be mine. I can’t wait to get started! How do you handle the “fear of the blank page”? “that very first mark on the first page of my heretofore untouched journal book that strikes fear into the hearts of not-so-confident new art journalers like me.” YES YES and YES. When I was younger I always wanted to write. I collected really pretty journals I could put my thoughts, doodles, and ideas into. I still have some YEARS later without a mark because I couldn’t bear tarnishing the beautiful pages. I did, and although it nearly killed me, it was really a relief to just get started. Oh, the fear of the blank page! Yes! I do more “art” than “journaling” in my art journal and I usually start out by just spraying some acrylic ink on the page in various places and colors just to get rid of that white! Then I find I can move forward a little easier. Have fun! Good idea! I did something similar with watered down acrylic paints. It helped a lot. Haven’t tried it yet but converted an old organizer calender into pages for just such an art journal/mixed media project. I’m trying to break away from being a perfectionist and “planner” in all of my art. Its fine when I do a specific painting, but making jewelry and mixed media I need to be less focused on the “what if it looks bad” and more focused on making and creating! So thats my next exercise, and this is totally me! Ooh! I like the “organizer calendar into journal” idea! I may have to try that! Also, what a great image/idea given your stated tendency toward ‘planned’ art — take a planner and totally un-make it! Enjoy! About ten years ago, I started using torn-out images from magazines and alumnae publications in my writing practice journals–not as illustrations per se, but just as illuminations that helped to express or focus my mood. It was addictive! The splashes of color, nature imagery, faces, sculptures, fueled my creative life like nothing else I’ve ever experienced. Now, with a two-year-old and a six-year-old, it’s been years since I’ve had the time to complete my writing practice in a dedicated way…but when they start (pre- and regular) school this fall, I plan to break out those notebooks and magazines again, with a vengeance! I love that idea, Heather — thanks for sharing! Wonderful, congrats on getting started, you’ve got a journal!! Every new journal I start, and I have filled many and started many more, the first page sort of taunts me. Well, not sort of. One of my games is to give a new journal to one of my kidlets, and have them make me something on the first page. They don’t get all caught up with ideas and fretting over what if they ruin the new journal. Once the first page is gone, getting going is easier. I also have them sit with me and finger paint and doodle here and there throughout my journals. They are wonderful lovelies for later too!